After announcing himself on the U23 scene with a plethora of wins, the most important of which came at the National Championships and the Tour de l’Avenir, Fabio Jakobsen hit the ground running in his first pro year, netting seven victories in the Deceuninck – Quick-Step jersey: Nokere Koerse, Scheldeprijs, and stages at the Tour des Fjords, BinckBank Tour, Tour of Slovakia and Tour of Guangxi, at the latter putting the finishing touch to the team’s outstanding season by claiming our 73rd UCI win of the year. These impressive results have brought Fabio a contract extension, which will see him sport the Deceuninck – Quick-Step jersey for an extra two years. Jakobsen is yet to make his debut this season, which will come next week, at the five-day Volta ao Algarve. From there, he will travel to Belgium for the 71st Kuurne-Brussels-Kuurne, before lining out for Paris-Nice, his first World Tour outing of the year. “I am very excited to continue with the team until at least 2021. 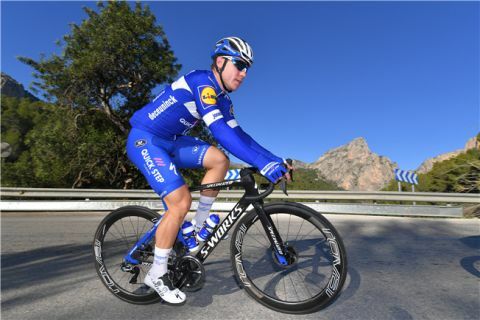 Deceuninck – Quick-Step is the team to be in, as I can learn so much and make important progress here. In the future, I want to be one of the best sprinters in the world and win big races, and Deceuninck – Quick-Step is the squad who can help me reach all these goals. I’m living the dream with the best team in the world and I’m grateful for the trust and the support I continuously receive”, said the 22-year-old Dutchman.